Howdy Side Income Blogging readers. 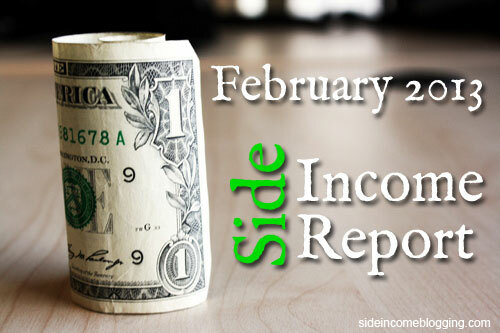 Today is March 7th, and a Side Income Report for February is way overdue, so let’s get to it! Up until February 18th, my traffic levels for February were lower than January – not a good thing. Fortunately on February 19th, I published Why Google+ will be critical for your blog’s success in 2013. This article was a big success on Google+ and on Pinterest, resulting in the big blue spike in the Analytics screenshot above. The spike represents 621 visits in a single day, a large number for my site. While I’m incredibly pleased with the success of that article, I’m not pleased at all with my overall traffic increase of 15%. The problem is that my search engine traffic has been dropping, which is interesting. 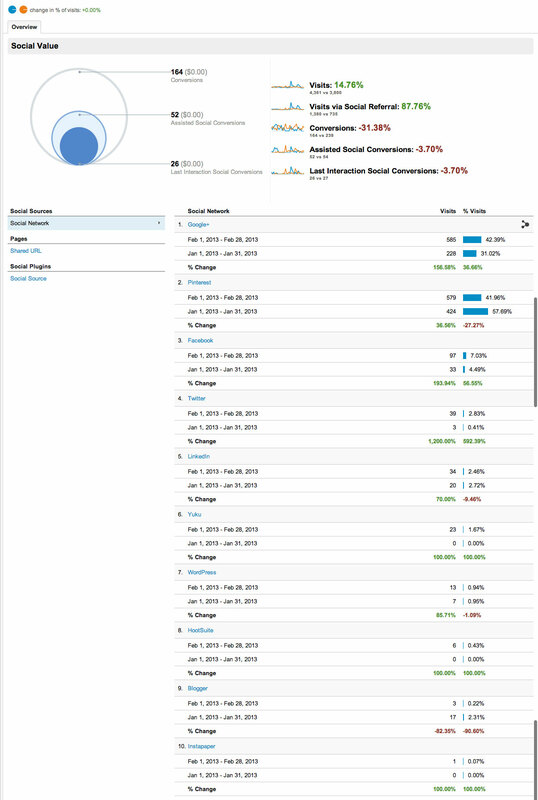 To be specific, from January to February, my search engine traffic dropped by 18%. Thinking on this some, I realized that I’ve really been focused on Google+ for the past two months. I have not been focusing on SEO optimization by using keywords and tweaking my articles for search engines. I haven’t really done any keyword research in the past month at all. While certainly not a complete study, I think this is a pretty strong indicator that keywords and keyword optimization are still very valuable. Honestly, I never thought they weren’t valuable, I guess I just got so caught up in Google+, I forgot to balance my writing – lesson learned. As I mentioned, I’ve had great success on Google+ and Pinterest in February. I just started tracking my Pinterest followers, so I don’t have a % increase yet, but I will next month. On Google+, my followers increased by 56%, which I’m very proud of. What’s also great is that the majority of these folks are very engaging. I also noted a significant increase in the follower count on my Google+ Side Income Blogging page as well for February. I find it ironic that my Facebook numbers went up, especially now that I’m not really active on it anymore. Something new I’m adding for February is information about my subscribers, which includes RSS and Email. My mailing list subscribers are up 10% for February. On February 28th, I had 320 list subscribers, up from 289 at the end of January. A small increase. I’ll need to work on that. I think finishing up my “freebie” eBook to give away to new and existing subscribers will really help with growth. Click rate is 1.6% – but I include the full article in my emails, so this isn’t a big surprise. Based on “industry” data in Mailchimp my numbers seem pretty close to normal industry numbers. RSS subscribes, which I thought was a slowly dying technology, were up by 16% from 73 to 85. This brings my total number of subscribers on 2/28 to 405. Now for the part everyone wants to hear about: The Money! As you saw in January’s report, the majority if my monthly income is from my Side Income Blogging Services work. I have recently added some additional affiliate offers to my Start a Money Making Blog series. I’m already seeing increased affiliate clicks as a result. I also published another article on BackupBuddy which contains affiliate links, and I’m seeing some clicks from there as well. I would anticipate seeing my affiliate revenue increase for the March income report. 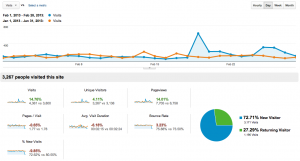 In February, I removed Adsense from Side Income Blogging. 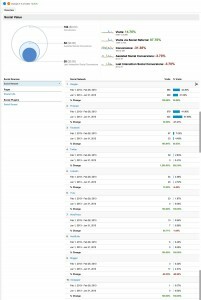 While I did show Adsense earning this month for $104.07 that is Adsense income from three different sites and over the course of 3-4 months. Side Income Blogging itself was earning less than $5/month. I decided to use that ad space for other options to see if I could earn more. I’ll keep you posted on how that goes. Great report. You a great job of monitoring your stats. I guess I need to start monitoring this way because as everyone say we treat out blogs as a business. 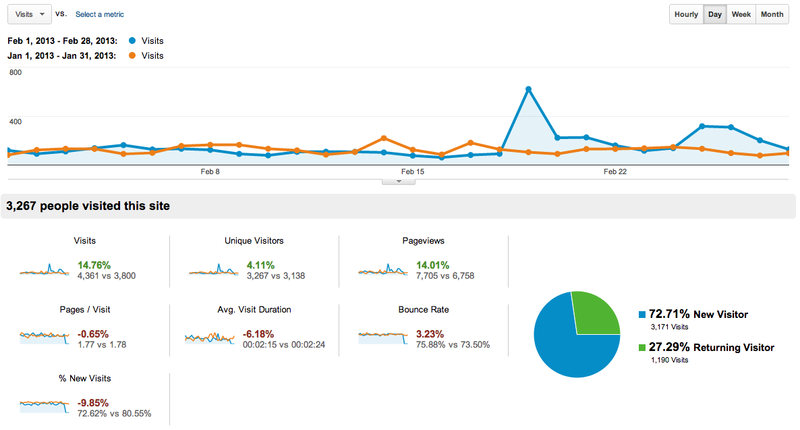 In Feb I generated almost $2k less than January, but traffic was nearly the same. Blogging, I may need to do the same for my education blog. Its getting plenty of traffic but not making much with AdSense. @Michael – Thanks. I’m a data person, can’t help it. Tracking really does help you keep an eye on growth and helps you know where to focus. @Rand – Now if I can just pull of a few more of those… You should post some monthly reports – I really enjoy reading those from different bloggers. @Jason – You’re welcome. My problem with Adsense may be traffic. I just don’t think my traffic levels are high enough to earn anything decent. It could possibly be my niche as well, but I won’t know that for sure until I get more traffic. Hi Susan. Thank you and glad you enjoyed it can got something helpful out of it. Thanks so much for taking the time to leave a comment. As a new subscriber/follower, I totally enjoyed what you’ve shared Larry. Very encouraging stats for newbies like me – perhaps one day will look at monetizing. Meanwhile thanks for sharing. Learnt so much from you already. Hi Yvonne – So glad to hear that me sharing this type of info encourages you and hopefully others. That is exactly why I share it. Glad to hear you’re getting value out of the site. Thanks so much for taking the time to comment. I spend a great deal of time each week on the articles, it’s really nice to read comments like yours. Makes it all worth it! Hi Larry, first time visiting your blog. I found you from Technorati. I love the way you shared your traffic, income & expense report. It gives a good transparency to the readers. Your income levels were higher comparing to your traffic stats. Keep trying to score those viral articles and your blog will soon get to 500, 1,000 and then 5,000 hits a day mark. Hey Tamal – Funny, I almost didn’t bother registering on Technorati, glad I did! I’m always been real open with my blogging, as I feel that’s what blogging is about – sharing personal stories, personal perspective and being truthful to your readers. Hi Larry, does this income include the income generated through your finance blog as well? Harshit, I don’t have my personal finance blog any longer. I sold it in 2009. This income is for this site and my various niche sites.